A rebuilt steering box with new gaskets, seals, bearings, fresh oil and new paint ready to install. 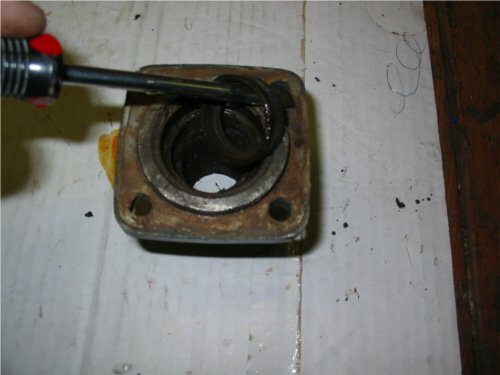 Steering box failure is a common service complaint. 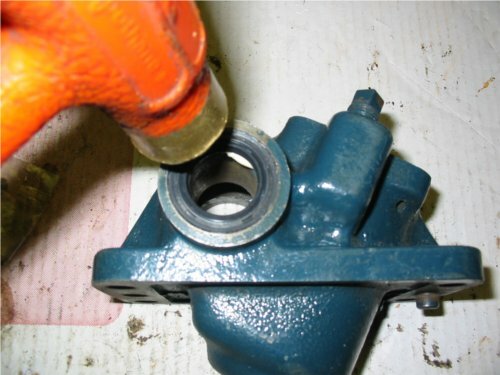 Increased effort to turn the wheel, crunching or clicking noises, steering wheel jerking or binding or a rusty, watery steering box are all symptoms that a steering box rebuild is necessary. We last left you with a torn down steering box, in pieces, ready for cleaning, repair and reassembly. 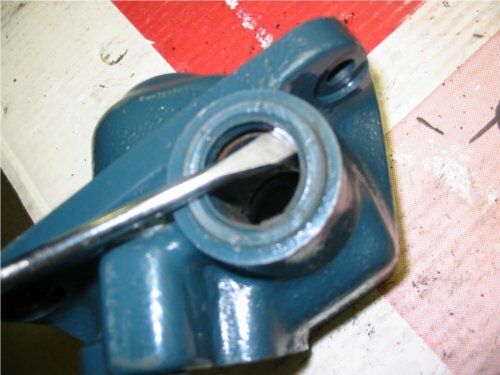 If you have not done so already, please go back and read both diagnosing and preventing steering box failure, and part 1 of steering box repair. Give the empty and now bare steering box a good wash out in the parts washer. In the absence of a proper parts washer, filling a coffee can with Varsol and dunking and scrubbing works well too to get the inside of the box. Be sure to dry out the inside of the box and keep an eye out for stray pieces of ground up metal, chunks of metal debris or other junk that could come back to haunt you later. Now is also the time to clean up the exterior of the case and sector cover. 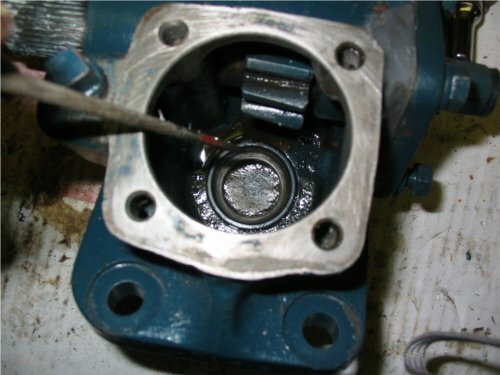 Remove any old gasket residue and grease before getting on with the re-assembly. A utility knife or gasket scraper work well to get the metal surface prepped for a new gasket. Finish up by using a little piece of emery cloth to clean up the sector shaft, case cover and steering tube-mounting flanges. If you desire, apply a little RTV silicone gasket maker in conjunction with a new Kubota gasket, or in the absence of a new gasket, the silicone will work just fine. 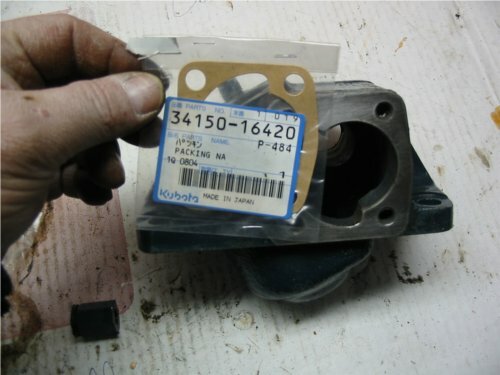 Installation of a new steering box gasket, Kubota part #34150-16420 for this particular steering box. The steering column tube is mated to a small cast mounting flange that is easily separated with a little gentle tapping from a brass drift hammer. Cast mounting flange partially separated atop the steering column that you will want to fully separate - gently. 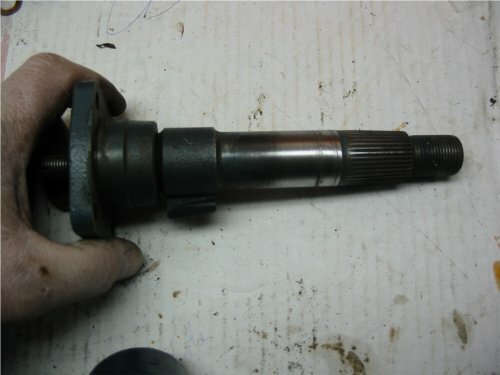 One the steering column and flange are apart, you will see the upper steering shaft support bearing race and behind it will be the lower steering column water/oil shaft seal. Upper steering shaft support bearing race. Lower steering column water and oil seal on the end of our screwdriver. 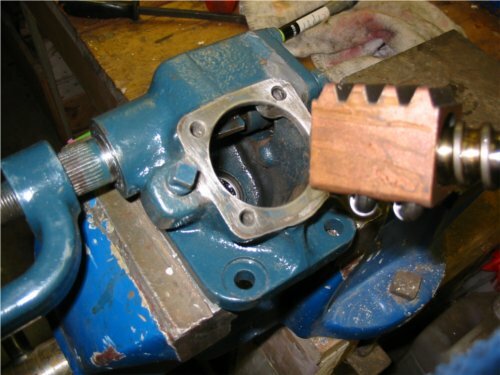 Now is the time to push or tap the upper bearing race out of the flange by using your bench vice and a cold chisel and brass drift. A few taps made around the race and it will drop out the bottom of the flange through the opening in your vice jaws. 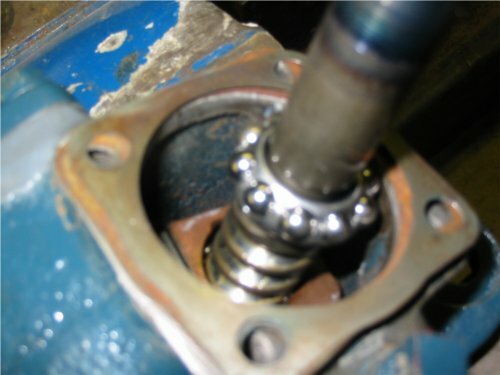 Tapping the upper bearing race out of the flange. 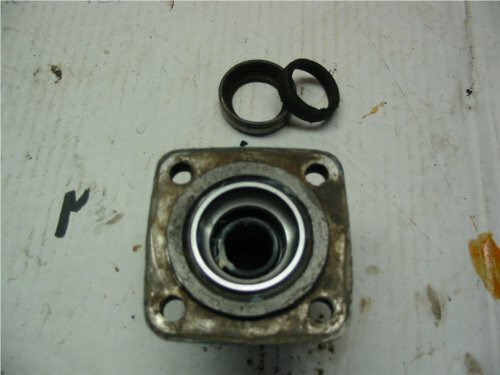 Once the old bearing race and seal are out it is an easy job to pick or pry the old seal before returning to the parts washer and give the inside of the flange a good cleaning. Now we prepare for a new flange seal. 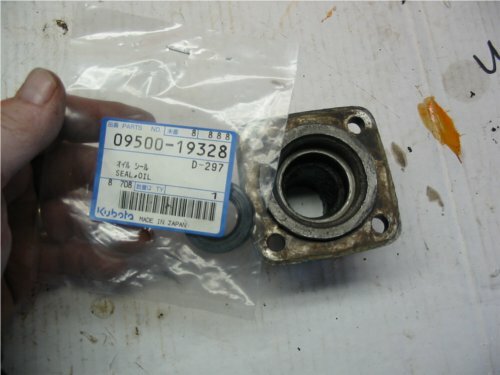 A new Kubota seal, part #09500-19328. Lube up the seal seat, or stop, with a little white lithium grease. It will make pressing the new seal in a snap and will prevent the chance that it will go in crooked. Apply white lithium grease into the seal seat. 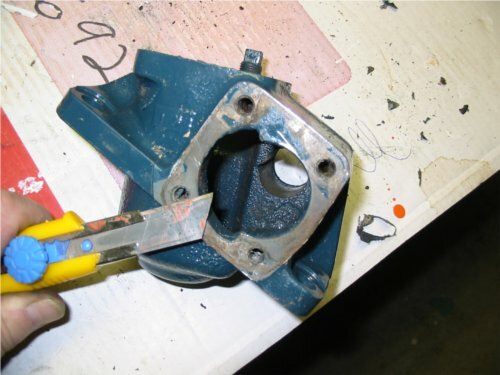 Once you have wiped a little grease in and around the seal destination area, place the new seal on the flange supported over your open vice jaws. Note the orientation of the seal as shown below. Position the flange in your vice and set the new seal on top as shown. If you do not have a seal and a bearing race setting tool, you can still get the job done by using a socket or other similarly sized round object. With your drift gently tap the seal into place making sure to tap it down into the flange until it rests against its stop. We are using a socket and a brass drift to seat the seal into place. 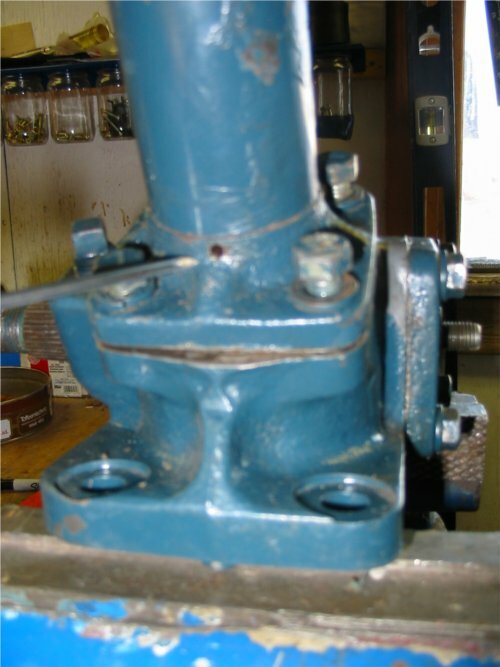 The seal will be seated to the correct depth when the top edge of it appears flush with the bearing race “stop”. With the seal in place we move onto installing a new bearing race – which is very similar in procedure to seating the new seal. 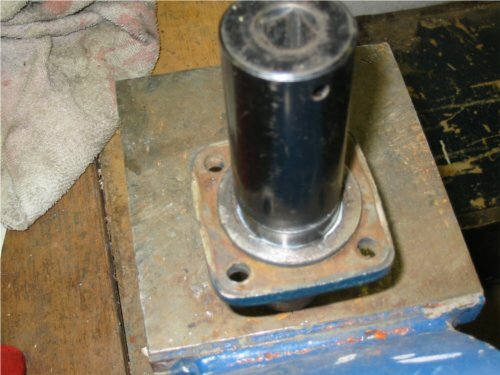 As before, place the new bearing race on the flange and using a slightly larger socket, tap the bearing race into place until it bottoms against the “stop”. 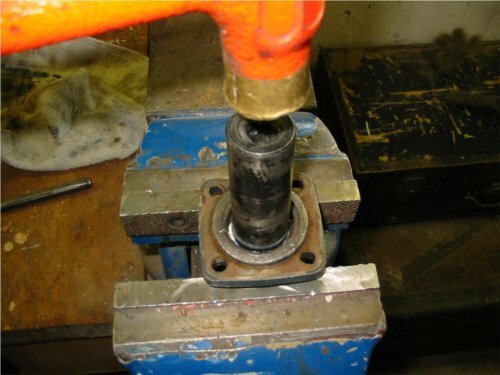 Tapping the bearing race using a large socket. 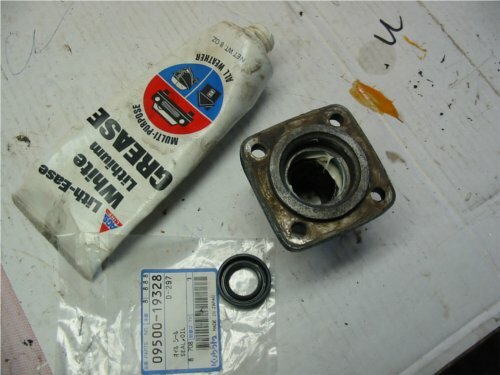 A correctly installed seal and bearing race. While the flange is off and before it is pressed back onto the steering column tube you separated earlier, use a drill bit in a twisting motion to clean out the “weep hole” in the flange. Use a small drill bit to clear out a blocked weep hole - the likely reason you are rebuilding your steering box. This hole must be clear and open to allow moisture and condensate to escape the column tube area and not infiltrate the steering box. There is a good chance that if you are rebuilding your steering box right now you are going to find this weep hole completely plugged! With the weep hole cleaned out, re-install the flange onto the steering column tube in preparation for the complete assembly of the steering box. 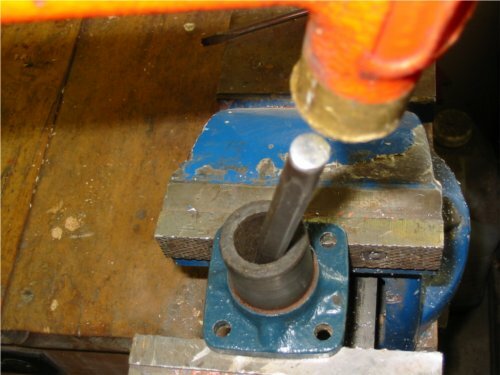 A block of wood and some tapping with a hammer will allow you to drive the tube back on flange, making them one again. Set the steering column and reattached flange aside and turn your attention toward the steering box. Looking into the steering box you should be able to see the lower steering shaft bearing race. 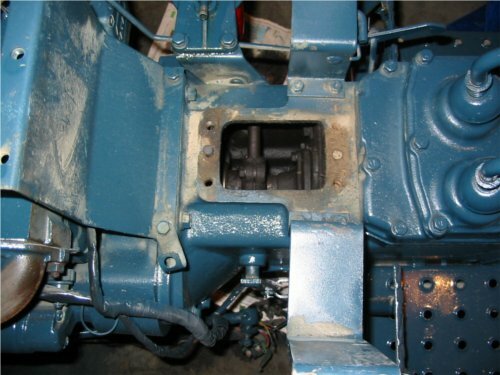 A view of the lower bearing race in the steering box. 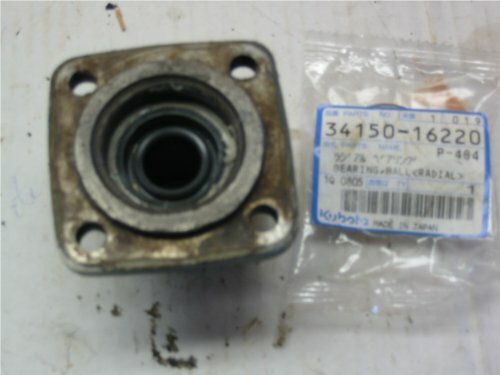 Kubota has a service tool specially designed to remove this bearing race. Without a specialized tool you can get the job done by using the head of a small construction nail as a pry tool. You should have just enough clearance under the bearing race to pry it up in an action similar to removing the lid off paint can. 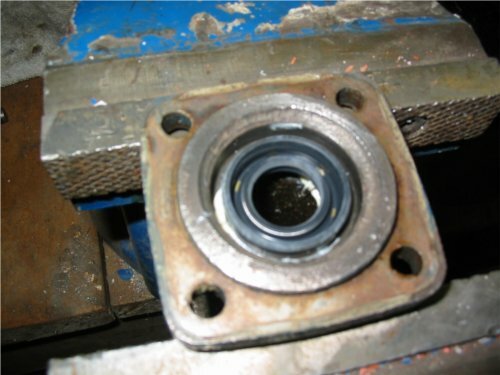 Once out, install a new bearing race by tapping it into place with a long socket and your brass drift. 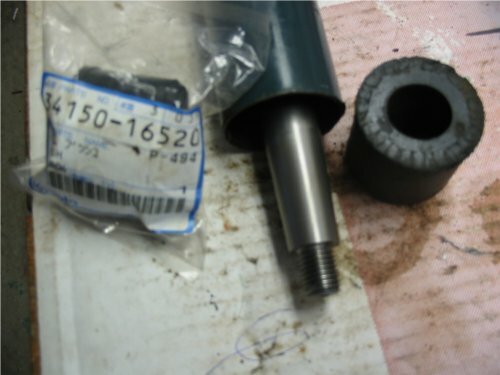 Next, remove the old pitman arm shaft seal with a screwdriver or similar pry tool. 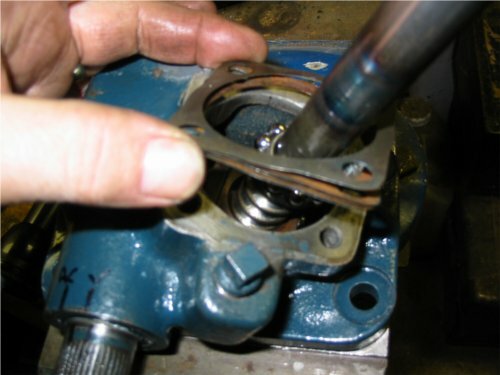 Removing the pitman arm shaft seal. Lube up the opening in the box where the new pitman arm seal will install and tap the seal into place with your drift and seal setter (or socket if necessary). The seal will sit flush with the edge of the housing when it is properly seated. Lube and tap the seal in until flush. Use of a little piece of emery cloth to clean up the area on the sector shaft where it will contact the new seal. Chances are the old seal wore a small groove in the sector shaft that will be visible but should clean up with the emery. Small groove visible from the old seal wearing on the sector shaft. Using a new gasket, slide the sector shaft back onto the box leaving the four bolts loose for right now. A new sector shaft gasket, part #34150-16420. The sector shaft installed back into the steering box with 4 mounting bolts loose. You are now at the point where you can install the new steering shaft into the steering box. Slide a new bearing down the shaft and let it rest just above the ball nut. Sliding the bearing down the shaft. In the next image note that the pitman arm has been temporarily installed, making for a convenient “handle”. This allows you to slowly rotate the sector shaft as you mate the worm drive on the ballnut with the sector shaft gearing. Temporarily installing the pitman arm lets us use it as a handle to rotate the sector shaft when mating the steering box gearing. 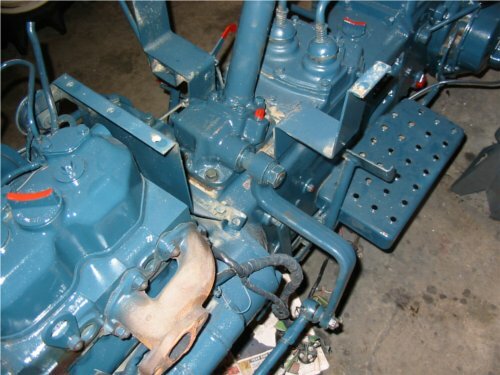 It may take you a few attempts to mesh the ballnut exactly with the sector shaft gearing. You want to make sure that the ballnut and sector gearing are exactly timed. When you rotate the steering shaft, as if you were steering the tractor, it will rotate an equal amount either left or right. Write down some handy reference marks that let you know when you have the proper reference timing. The R and L reference marks here assist when getting the steering box timing setup. If you are satisfied that the sector shaft is correctly placed, reinstall the column tube but make sure to reinstall the same quantity of shims that may have been removed during dis-assembly and cleaning of the box. 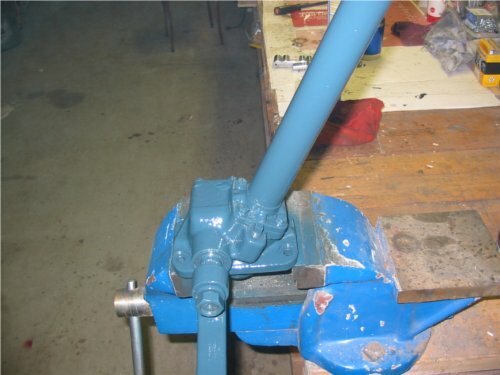 Carefully hold the steering shaft upright in an effort to maintain a positive engagement of the gearing on the sector shaft and the ballnut. Slide the column tube over the steering shaft making sure to orient the weep hole as shown in the next image. Install the four mounting flange bolts and locks finger tight for now. 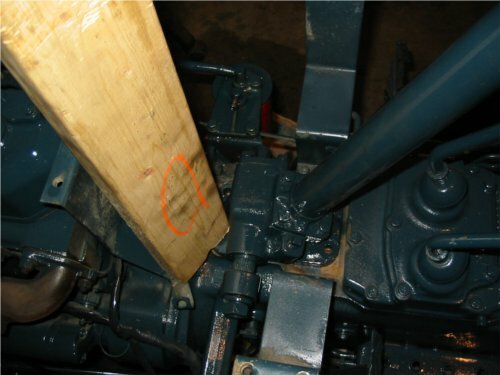 Column tube mounted over the steering shaft with weep hole as shown. With the column attached to the box casting it is time to install a new upper column steering shaft bushing. It is this bushing and a plugged weep hole that are responsible for a good many steering box failures and rebuilds! The old bushing removed and the new one ready to go. 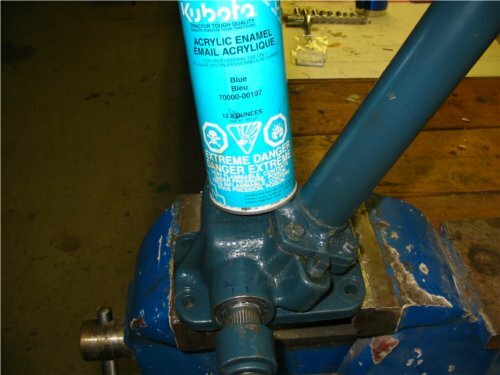 Lube up the bushing itself and slide it onto the shaft making sure it sits flush with the top of the column tube. 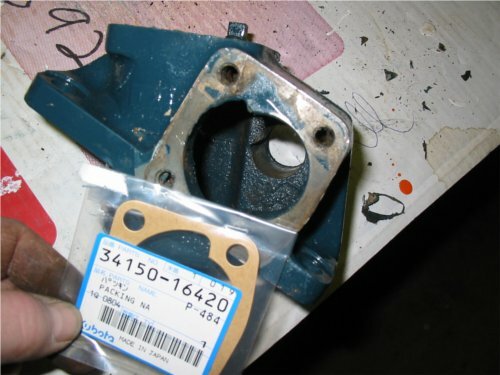 Expect this bushing to fit snug as it is the primary water seal for the steering box. 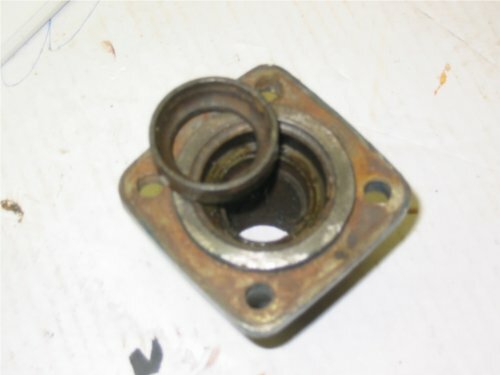 The column bushing flush installed at the top of the steering column. Before tightening up the flange mounting bolts or the sector shaft case bolts, remove the sector shaft “free play” cover nut and loosen off the adjuster with a flat blade screwdriver. This adjuster controls the end play of the sector shaft. Loosening it off ensures the sector shaft will be freely centered in the box. Tighten the sector shaft case bolts left loose earlier and then tighten down the flange bolts using a cross tightening pattern. 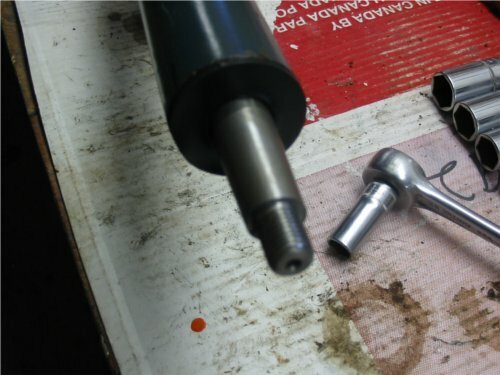 When tightening the flange bolts rotate the steering shaft a little each time to make sure nothing is binding internally on the shaft, bearings or ballnut. 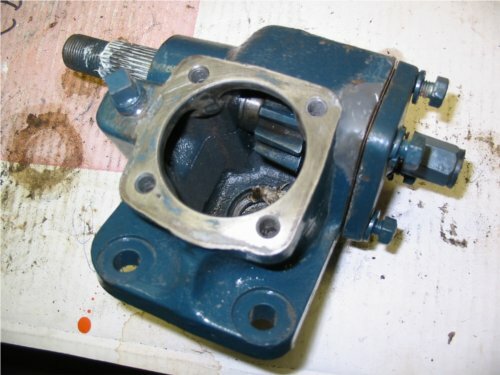 Once you are satisfied that everything is tightened up and the steering shaft rotates freely, adjust out the sector shaft free play by turning the adjuster with a slotted screwdriver just to the point that it removes any lateral movement of the sector shaft without making the box difficult to operate. Next, replace the sector shaft cover nut. When installing the pitman arm look for a reference mark scored across the end of the threaded part of the sector shaft that will form a straight line when lined up with the stamped markings on the pitman arm. The box is now fully assembled. Fill it with new 80W/90 gear oil through the filler located on the box casting. 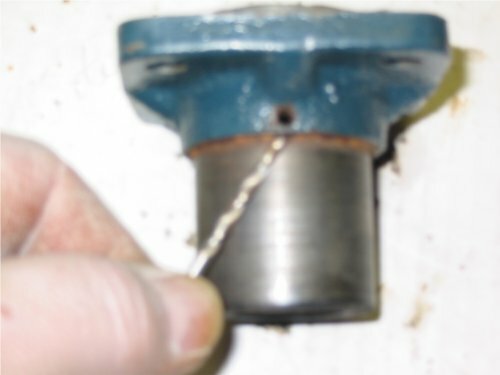 The holding reservoir does not hold much oil – only about 1-1/2 cups. Assembled steering box and common capacities listed. 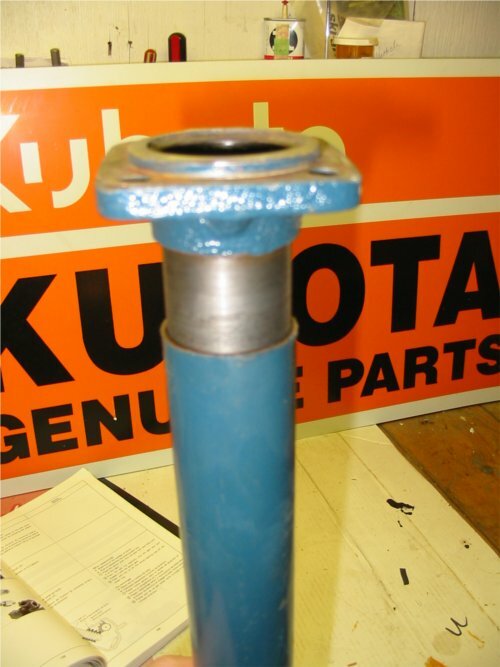 If you are so inclined it does not hurt to go over your rebuilt assembly with a little Kubota blue #70000-00197 to freshen up the parts. Wipe down the assembly to remove grease, debris and dirt and then dust a new coat of Kubota blue. The steering box may need a little coaxing to get it settled onto the metal doweling that help hold the box in place. Metal dowels that help hold the steering box assembly onto the top of the transmission housing. The dowels fit quite tight but a 2’ length of 2×4 wood and a dead blow hammer will help get the box settled in place on top of the transmission housing. Using a length of wood to tap the base of the steering box onto the dowels. 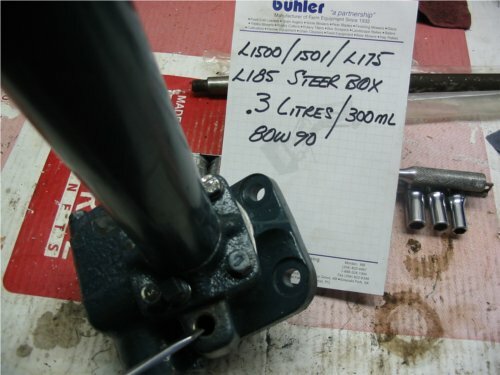 Once seated, install the four bolts that secure the box assembly to the tractor, reattach the drag link to the pitman arm, add a dab of red paint to the filler, and your steering box overhaul is complete!